ANOTHER FREEBIE FROM THRIVE MARKET!! Yes, you can have chocolate for breakfast—and we’re not talking about sugary breakfast cereal. 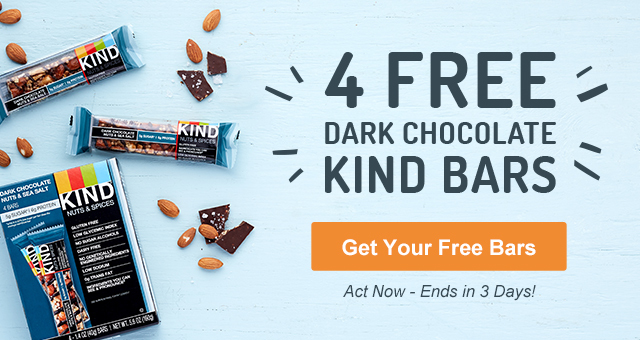 KIND Dark Chocolate Nuts and Sea Salt Bars are a healthy way to get the flavor you crave. Packed with almonds, peanuts, and walnuts, each bar has 6 grams of protein but only 5 grams of sugar. Plus, they’re much more portable than a bowl of cereal. Win-win. $1.95 shipping and handling. New (first-time) customers only. One per customer. Purchase of free gift enrolls you into Thrive Market 30-day trial membership. Not combinable with other offers. Quantities of this special offer are limited and subject to continued availability. Limited offer expires when supplies run out.